Madelynn “Maddy” Castro is the 18-year-old daughter of Courtney and Joseph Cantu. Maddy is in the top 20% of her graduating class. Maddy is involved with all that Floresville High School and the community have to offer. She is a member of Business Professionals of America, serves as Treasurer of the Senior Class and the National Honor Society. She is Vice President of Junior Catholic Daughters Association and serves as Queen Tunaep for the Floresville Peanut Festival Association. She currently works in the FHS office through the FISD co-op program in addition to babysitting, working for RK Catering, and keeping up with her coursework for her all advanced classes. Maddy has been recognized as Academic All-District every year since her freshman year in both volleyball and golf. She was an alternate to State for Prepared Speech in BPA and placed first with a perfect score at State Word Processing. This year, Maddy earned 1st place in the district in Basic Office Skills and Procedures. 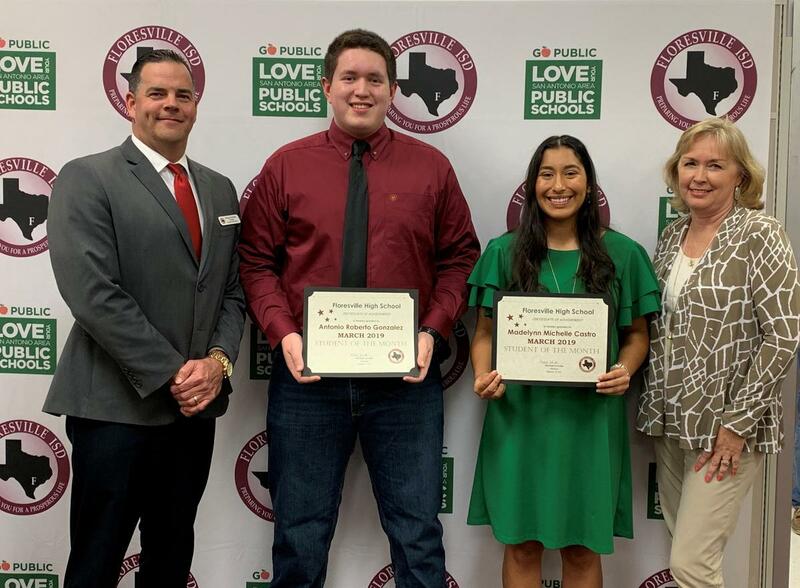 Maddy served as a member of the FISD Core Beliefs Committee, and she was an important student voice representing the high school on the Strategic Planning Team. In the fall, Maddy was featured on KENS 5 regarding her life as a Dual Credit Student at Floresville High School. When not busy with school or her jobs, Maddy volunteers her time with SAPD Blue Santa, visiting area nursing homes, working at the public library and working with various children’s organizations in the area. Maddy plans to attend Texas Tech, Texas A&M Corpus Christi or Blinn College where she plans to major in Journalism or Business with a Pre-Law interest. Her strengths are Restorative, Futuristic, Competition, Strategic and Includer. Antonio Gonzalez is the 18-year-old son of Christine and David Miller. He is in the top quarter of his graduating class. Antonio is a member of the Floresville High School Tiger football team which he represented FHS in the San Antonio All-Star Game in January. Antonio was a 2nd team all-district tackle. He is a member of the National Honor Society and takes all advanced classes. Antonio is a member of From Boys to Men, serving as a mentor to an FSE 4th grade male student. In his spare time, Antonio visits local nursing homes and loves to hunt, fish and workout. Antonio will be attending the University of Incarnate Word as a student and an athlete. He will be a member of the Cardinal Football team and will be majoring in mechanical engineering. His strengths are Deliberative, Futuristic, Competition, Maximizer, and Individualization.